I have to share something that I think is super cool! I like to find unique ways of organizing. 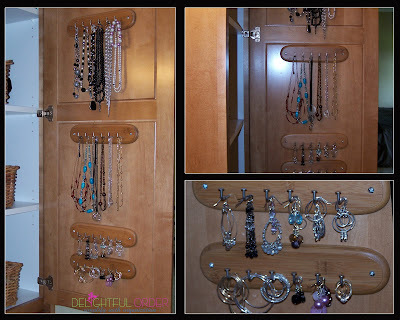 I attached them to the inside of my master bathroom cabinet door, and hung all my jewelry from the hooks. I hang my rings on the hooks too. Works great for me. Question; How do you organize your jewelry? Great ideas! People really need to see these wonderful ideas. Love it - I desperately need to do this same exact thing! Just need to figure out somewhere to do it. Nice job! I actually used one of those shoe racks that hang on your doors. I am amazed at how many necklaces/bracelets and earrings I now have hanging on the back of my master bedroom door. What a great idea! Looks so nice too. Nice work! Do the earrings that have the open back u shape to them stay on when the door is closed and in motion? Love this idea! Yes, Jaycee they do for the most part, unless some little one (like my 2 yr. old.) slams the door shut real hard, then they will fall. Visiting from the 52 weeks...what a cute idea and it can work as art as well! I have room in my dresser to store my earrings in ice cube trays (3 stack on top of each other) and bracelets are in aluminum muffin tins. Many years ago at a craft show someone was selling necklace boards. It is a particular type of foam board that is self healing in a frame, I use corsage pins and push pins to hang necklaces there. I think you could do the same with foam core board though it's not self healing. I have a ton of necklaces, so mine had to go in a place where there was lots of room for them to hand. This is a great idea. I have a built in vanity in my new bedroom and though it's from the seventies and needs to be updated (lol), it does have two wide, deep cabinet areas at the bottom that I can apply this idea to. Thanks for the inspiration! I hang by earrings on a 2$ straw bag which I hang next to my vanity. And on my vanity I have a mini mannequin necklace holder and along my wood-framed mirror I have tacks that hold necklaces. I also have various wooden jewelery boxes from Guatemala (like wooden apples that open, and a beautiful hand-painted mini jewelry chest). These hold some gold and silver jewelry. Great idea. I recently bought some cork tiles at Walmart and stuck them to the side of my closet. I use pushpins to pin up my more delicate necklaces. I am loving this but was looking for an idea for my chunkier jewelry that a push pin won't hold. This would work great! I use clear plastic blister boxes, like the ones that beads come in, or nails, etc... Then I can just keep everything in a drawer. Things don't get tangled or lost, and I can see right away to grab the item I want. I used an antique picture frame from a garage sale, removed the backing, sprayed it with some high-gloss paint and stapled some lace from Walmart's fabric section to the back. 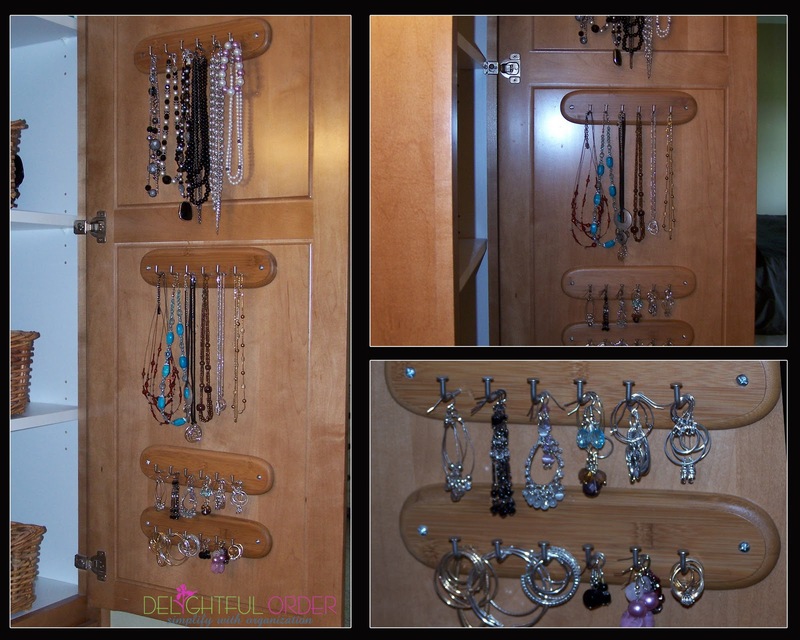 I hang all of my earrings at the top and then used S hooks from Fleet Farm to hold my necklaces. It is hung on the wall in my bedroom (college student :)) and looks beautiful plus it's right next to my mirror so I can accessorize more easily!